Tuesday February 4 1908 I went down town this forenoon. did a lot of errands and went over home for dinner. It snowed terribly I got back at 4.28 and made tatting after the evening work was done Will sold the hogs today. Wednesday February 5 1908 I fried down the sausage and as I worked at that till noon I was most of the afternoon doing other work. Will went to town this morning to bank the money for the hogs $437.88 I worked at my tatting in evening. weather some warmer. Thursday February 6 1908 I made mincemeat in the forenoon and did house-work most of the afternoon I tried to fix my white waist that was made in the fall. I made tatting in the evening George Stevens had a sale today. 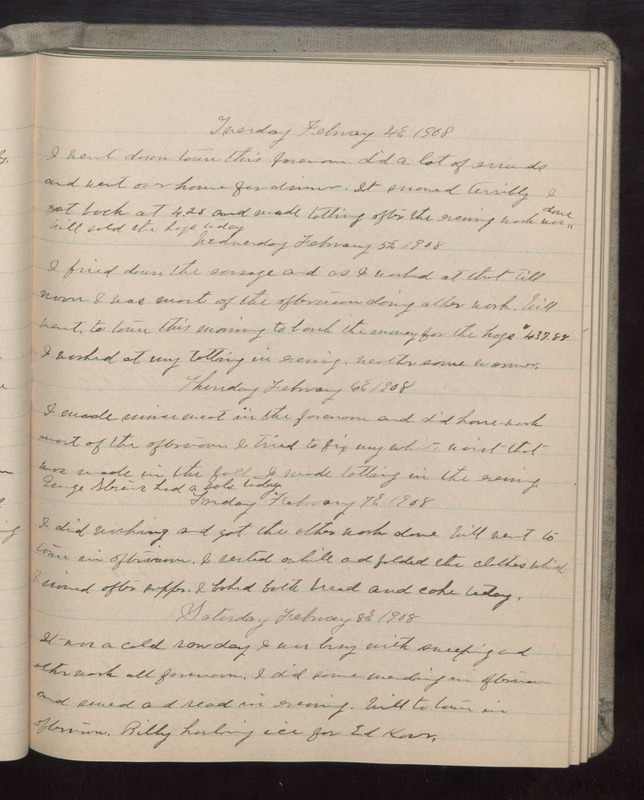 Friday February 7 1908 I did washing and got the other work done Will went to town in afternoon. I rested awhile and folded the clothes which I ironed after supper. I baked both bread and cake today. Saturday February 8 1908 It was a cold raw day I was busy with sweeping and other work all forenoon. I did some mending in afternoon and sewed and read in evening. Will to town in afternoon. Billy hauling ice for Ed [Kover? ].